PoolTux King Light Weight Solid Safety Pool Cover - 12ft x 20ft for your in ground swimming pool will protect your family and pets from accidental drowning while having a nice neat and clean appearance of your pool area in the off-season. These safety covers keep debris and sunlight out while preventing unwanted accidental intrusion. This durable cover is only half the weight of a full-weight solid for added ease during installation and removal. The King Lightweight solid safety cover features the patented Aquaduc drain that runs from one end of the cover to the other, which practically eliminates puddles and comes with mesh drain panels. Flush mount brass anchors and collars are non-corrosive and easy to adjust and each cover comes complete with brass anchors, commercial grade stainless steel springs, installation rod, and tamping tool. 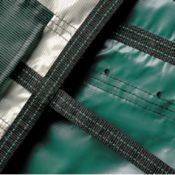 The King Solid safety cover comes with a 5 x 5 strap spacing. FREE SHIPPING!!! This durable cover is only half the weight of a full-weight solid for added ease during installation and removal. PLEASE NOTE THAT THIS SIZE COVER DOES NOT COME WITH A STEP SECTION OPTION AND IF YOU NEED A STEP SECTION ADDED THEN IT WILL BE A CUSTOM COVER AND YOU WILL NEED TO SUBMIT THE CUSTOM SAFETY COVER MEASURING FORM FROM THE LINK ABOVE!!!. Aquaduct Drain That Runs From One End of the Cover to the Other Practically Eliminates Puddles.